Taki: has no distinguished ninja look. Taki never wears coat; she also either uses a skin tight outfit, or shows a lot of skin. Cassandra: the SC2 3P outfit is based on Valkyrie. Armor should be brighter and her helmet should have wings. Abelia: she is quite spot-on, but you might want to put corset on her to cover that weird gap between her top and skirt. Siegfried! 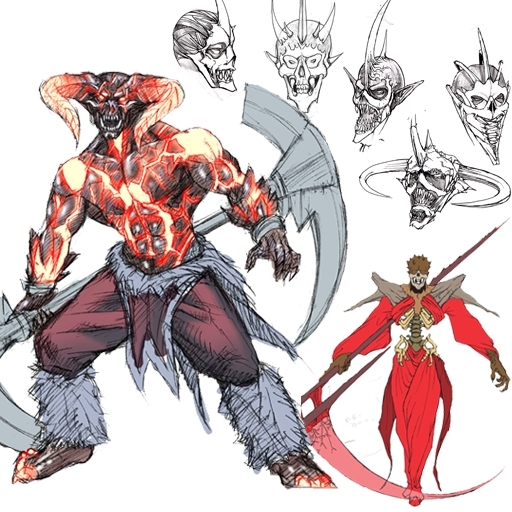 : I assume you never play Soul Edge. Sieg's armor should be fleshy red. Johan Durer: I never care about Johan, but I think he'd appreciate a non-glowing waist item. Seong Han-myeong: Good style and overall look, but if you're trying for his SE/SB look, his color is wrong. His top should be washed out purple and his pants should be purplish, instead of deep blue. Abyss: Yeah, no. Abyss should be very skinny and not red. You should tweak him a bit and make him an original character. Arcturus: Good use of pattern. He can use some touch, but I can't think what to add to him, especially since SC5 is very restricting. Frederick: Matching his SC4 rendition, but his armor should be of 1 color. Revenant: Same tacky look as the original Revenant, good one! I wonder whether or not can you turn him to real Revenant using the skeleton costume? Mooncalf: Very tacky. What's with the random kanji "soul" and "moon"? Neither of the two other character I ever see with colors, so no comment. No one in the history of killer/mercenary/assassins want to write such thing on their bosom. Not to mention a gratuitous use of Japanese language. I'd suggest you remove the kanji because those made her look silly. the one with big horns.. Sorry that you felt that way, but I gave valid critique with reasonable arguments. I praised half of them, but seems you only focus on the negatives. Deleting thread run the risk of ruining forum structure, so I can't do that, sorry.